Many people around the country celebrate Halloween by carving pumpkins into spooky, silly, or creative Jack-o-lanterns. However, outside of local grocery stores and farmer's markets, many don't know where to get a pumpkin this time of year. Fortunately, there are plenty of pumpkin patches near Albuquerque where you can pick-your-own orange squash. 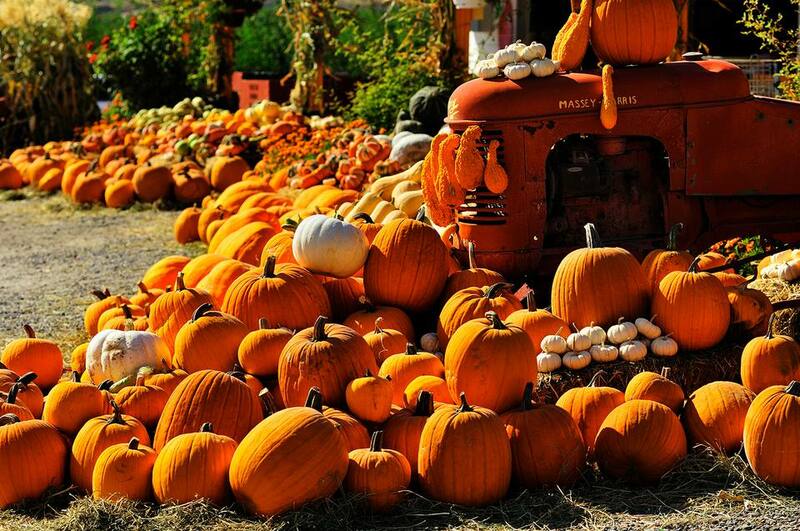 Whether you're living in or visiting Albuquerque this October or November, consider stopping by one of these local farms and patches to get your pumpkin instead of your neighborhood market. Not only will you be supporting Albuquerque farmers and agribusinesses, but a day at the farm is also a great way to enjoy the fall weather of Albuquerque. Head over to the Santa Ana Star Center in Rio Rancho, New Mexico, for the annual Galloping Grace Pumpkin Patch. Open daily in October from 9 a.m. to 6 p.m., this multi-acre patch has pumpkins, a mini corn maze, a roping arena, duck races, a corn pit, a harvest maze, tractor races, and other activities geared toward younger kids. There is also a country store and fall decor for sale. The patch supports the Galloping Grace Youth Ranch in Rio Rancho, where any child can ride horses and learn about ranch life and responsibilities. Galloping Grace also has summer camps and special seasonal activities for children. If you're looking for an educational experience to go along with your pumpkin picking adventure, you can head over to the Rio Grande Community Farm every Saturday and Sunday in October to explore its seasonal Maize Maze and pumpkin patch. The fun and adventure of the eight-acre maze also include activities such as pumpkin painting and harvest fun. On October 27, the Fall Festival and FunRun will take over the farm to raise money for the educational programming provided by Explora, the Audubon Society, ABQ BioPark, and Bilingual Birdies. There is so much to do at McCall's Pumpkin Patch in Moriarty, New Mexico, that it requires a full day to get all the fun in. There are hayrides, a miner's shack, pedal karts, a corn maze, gemstone mining, a small wild west recreation village, a pumpkin cannon, animals to pet, a goat bridge, a country store, Bunnyville, a hay pyramid, pumpkin slingshots, a giant slide, corn cannons, fossil dig sandboxes, a cow train, a corn box, a hay tunnel, duck races, a hillbilly band, and of course, pumpkin picking. You can purchase tickets online or at the gate, and the patch is open on weekends for the general public and reserved for groups during the week. McCall's Pumpkin Patch's 20th season runs from September 22 to October 28, 2018. Fall isn't complete without a trip to Wagner Farms. In the heart of agricultural Corrales, the farm offers fresh roasted chiles, seasonal fruits and vegetables, and a place to pick out a pumpkin or two. Wagner Farms also features hayrides, a one-acre corn maze, an apple orchard, a vineyard, and a petting zoo as well as hay bale structures and games in a children's play area, and there are even night mazes with harvest bonfires. The maze is open seven days a week, Sunday through Friday from 9 a.m. to 6 p.m. and Saturday 9 a.m. to 10 p.m. Additionally, Wagner Farms will celebrate the fourth annual Apple & Pumpkin Fest on October 14 and 15, 2018. The Wagner's Farmland Experience in Los Lunas has the same fun as the attraction in Corrales, but you can enjoy two corn mazes here in addition to the farm animals and fall activities. However, starting on September 20, 2018, Wanger's Fall Fun will transform the farm into an exciting pirate adventure every night of the week. There is also now a u-pick flower and vegetable patch alongside the pick-your-own pumpkin patch, and every Saturday night, the farm hosts a haunted night in the mazes. If you don't need a pumpkin but still want to take part in some fall-themed fun, you can head over to the Punkin Chunkin Festival in Estancia. Started by local farmers in 1995, this annual event includes a contest where builders create and use trebuchets to throw pumpkins the longest distance. The 23rd annual event will take place on October 20, 2018, and proceeds will be used to help local students pay for college by showcasing their custom-built machines used to launch pumpkins in the contest. There is also a pumpkin patch just north of Estancia on the way to the Punkin Chunkin, and there will be pumpkins available at the festival as well.